The new 2014 Core Curriculum applies to all students who entered Newberry on or after Aug. 17, 2014. The Core Curriculum was revamped to better enable students to meet general education requirements and more fully align with the College’s mission and goals, which emphasize intellectual development, personal development, meaningful vocation and engaged citizenship in a global society. The new Core Curriculum places greater emphasis on the core competencies of critical thinking, communication and quantitative literacy. It is designed to give students basic exposure to the principal areas of knowledge, including humanities and fine arts, social and behavioral sciences, and natural sciences and mathematics while mastering the basic skills to prepare for life after graduation. A single course may not satisfy multiple requirements in sections A-E.  If a student is awarded transfer credit for a course that carries a Newberry College core tag, the student will also be awarded credit for the tag. This policy does not apply to the WI tag; all WI requirements must be satisfied by Newberry College coursework. Please see the current catalog for greater detail. Inquiry Courses (INQ) A thematic, academic-based, writing and oral intensive course that serves as an introduction to the Quality Enhancement Plan and Values-Based Learning. Some course meetings will build assignments around a unique theme, while other course meetings will be common curriculum based on the QEP/VBL. Perspectives Courses Courses designed to provide a basis in liberal arts. These courses will develop the critical thinking skills gained in the freshman INQ courses and expand knowledge in Humanities and Fine Arts. Capstone Experience Senior-level, discipline-specific course that integrates program learning outcomes and may include methods, skills, research and practice. These courses are part of the major with credit hours determined by the department. Interdisciplinary Coursework (IDS) Uses methodologies of one discipline to expand learning in multiple disciplines. These creative courses integrate a theme or topic that is more effectively examined and explored through a multi-disciplinary approach. Courses are typically capped at 15 students. At least one of these interdisciplinary courses must be outside of the student‘s department. Experiential Learning Applied learning that may incorporate engaged learning experiences or projects, such as civic engagement, service learning, community-based learning, etc. This work is part of the major and the credit hours are determined by the department. These experiences include Internships, program practicums, clinicals, study abroad/study away. Tagged Courses Designed to meet key student learning outcomes that support the College mission and goals, tagged courses may change from year to year, so students and faculty should consult the most recent edition of the Newberry College Catalog to determine tagged courses for a given academic year.